The Da Nang authorities launched a drill from 3am to 7am on September 17 to prepare effective responses in the case of widespead power outages across the city, in service of the APEC High-level Week 2017 scheduled for November. Participants in the exercise were the Vinmec International Hospital, Vinpearl Resort, Pullman Resort, Intercontinental Resort, Sheraton Resort, Furama Villas, Furama Resort, the Da Nang International Airport, the management board of the Municipal Administrative Centre building and the Tien Son Sports Palace. Others included the International Media Centre, the Office of the Da Nang Party Committee, the Da Nang Power One Member Limited Liability Company, the Power Transmission Comany No. 2, the Central Region High Voltage Grid Company, the Central Power Corporation, the Central Region Load Dispatch Centre, and the Da Nang Fire Fighting Police Department. The Da Nang People’s Committee assigned the municipal Department of Industry and Trade, in collaboration with the Da Nang Power One Member Limited Liability Company and relevant agencies, to implement the drill and report the implementation outcomes to the municipal People’s Committee. The units in charge of power management at the venues that host important events during the APEC High-level Week 2017 were responsible for maintaining and inspecting the power systems and connectors, aiming to ensure smooth operations during the drill process. The exercise aims to evaluate the adaptability to power outage incidents, strengthen coordination between relevant units, examine the ability to supply on-site power sources (ATS, MF, UPS), and detect and address any arising shortcomings after the drill. The 14th annual Southeast Asia Red Cross Red Crescent Leadership Meeting is set to take place on September 21-22 in Hanoi, according to the Vietnam Red Cross Society (VRCS). VRCS President Nguyen Thi Xuan Thu highlighted the meeting as an important event of the Southeast Asia Red Cross and Red Crescent Movement which is held in rotation in member nations. Discussions will be focused on the building of a safe community in terms of disaster management, health care, capacity enhancement, gender and emigration, youth development and cooperation in climate change response and urban development. The meeting will also touch upon the agenda of the 21st General Assembly of the International Federation of Red Cross and Red Crescent Societies and the Red Cross and Red Crescent Forum to be held in November 2017 in Turkey. Within the framework of the meeting, the VRCS will sign a series of humanitarian cooperation agreements for the 2017-20120 period with its partners from Laos and Cambodia. A fire occurred early Saturday at the Thành Đô Supermarket on Giải Phóng Street in Hà Nội’s Thanh Xuân District. No casualties were reported, but the fire destroyed all the goods in the supermarket and its two storeys collapsed. Local residents said that despite the heavy rain at the time, the fire spread rapidly due to flammable objects at the site. Dozens of fire engines were mobilised and the blaze was extinguished within two hours. Phuong Chau International Hospital held an annual scientific conference in the Mekong Delta city of Can Tho on September 17 to discuss new medical issues in the fields of obstetrics, pediatrics, infertility and cosmetic surgery. At six sessions of discussion at three conference halls during the Annual Conference of Phuong Chau International Hospital (ACP 2017), more than 600 local and international delegates heard and discussed 30 reports by physicians from HCMC, Hanoi, Can Tho City and Jakarta. This year, they focused on toddler safety and the role of nurses. Notably, the University Medical Center HCMC introduced reports on toddler protection and the Can Tho Obstetrics Hospital reported effects of the Kangaroo therapy on premature births. Representatives of other medical centers discussed child raising, surgery risk management and laser therapy. Speaking to the Daily, Dr. Nguyen Thi Ngoc Ho, director of Phuong Chau International Hospital, said the conference would help the hospital further develop its closed and comprehensive health care chain. The chain provides patients in the Mekong Delta with a closed service process from diagnosis, treatment and care, and effectively links different wards of the hospital such as infertility, andrology, obstetrics & gynecology, pediatrics & neonatology, and general practice, she said. She added professional and devoted physicians and health workers are in charge of operating the chain. Poor localities in the Central Highlands region have benefited from a Government programme to build irrigation systems, rural transportation systems and markets, public works, and support production. The region is allocated nearly 460 billion VND (17.86 million USD) under Programme 135 this year. According to the Steering Committee for Central Highlands Region, regional provinces have distributed capital from the programme in a fair and transparent manner based on the demand of each locality, with priority to remote, mountainous and poor localities. They have also linked the programme with other programmes such as the building of new-style rural areas, while engaging the community in building public works. At the same time, they have also showed strong performance in implementing support policies to support ethnic minority people in settling down by providing them with housing and faming land, and capital assistance. The programme, launched in 1999, aims to improve living conditions for rural residents with a particular focus on ethnic minority communities. A list of 2,139 extremely disadvantaged and border communes in 46 provinces nationwide are eligible for Programme 135 in 2017-2020. In an effort to raise the rate of medical insurance coverage amongst students, the Ministry of Health sent its document asking schools to increase information of insurance policies and important roles of healthcare insurance to students and their parents. By the Vietnam Social Insurance Company’s statistic, the rate of students buying healthcare insurance drastically leaped from 85 percent in the school year 2013 - 2014 to 92 percent in 2016 - 2017. However, it seems this rate has been not much because they don’t fully understand the benefit of participating healthcare insurance and authorities have carried out supervision of insurance implementation unregularly. The Ministry ordered to work with local social insurance units to encourage students and parents to buy healthcare insurance as per the law. Additionally, local people’s committees should consult the amount for buying healthcare insurance and provide support to students from low-income in accordance with the present regulation. Most of all, the Ministry urged to increase supervision of medical insurance implementation in schools. Once discovering wrongdoings, inspectors will issue penalties on violators. After storm Doksuri, the 10th storm arising in the East Sea this year, made a landfall in the coastal central provinces, tens of kilometers of sea embankment from Nghe An Province to Thanh Hoa province were destroyed totally. For instance, the storm crashed sea dykes in Quang Nham commune in Thanh Hoa province’s Quang Xuong to collapse. The beach and embankments have been left covered in debris. By statistic, the storm caused the estimated damages of VND1 trillion ($44 million) in Thanh Hoa Province. Meantime in Nghe An Province, 1,325 meter dyke; 300 meter embankment in Quynh Luu District; Quynh Tho Town; 1,000 meter embankment in Quynh Bang collapsed into sea. Total damage is worth VND518 billion. Accordingly, Nghe An government proposed the government to give support of VND300 billion for repairing the embankment and infrastructure plus buying six excavators to dredge sand and stone to clear traffic congestion in the mountainous districts. The Vietnam Red Cross (VRC) on September 17 offered aid worth more than 1.5 billion VND (66,000 USD) to provinces affected by storm Doksuri. The provinces are Thanh Hoa, Nghe An, Ha Tinh, Quang Binh, Quang Tri and Thua Thien-Hue. The funding is set to assist families of people killed during the storm and 240 households, whose houses collapsed, with three million VND (132 USD) each. Also, 650 families whose houses were severely damaged will receive one million (44 USD) each. The aid will also be used to cover the expense of 150 house repair kits. The VRC called on its chapters, members and people nationwide to provide assistance for those in need. The campaign will last until the end of October. In addition, people in isolated areas in Ky Anh district of Ha Tinh province and areas hit hardest by storm Doksuri in Quang Binh province will receive 24,000 bottles of drinking water from Coca-Cola Vietnam, said the VRC on September 18. Meanwhile, a working delegation of the Ho Chi Minh Communist Youth Union Central Committee led by Secretary Nguyen Anh Tuan on September 17 presented 25 gift sets worth 50 million (2,200 USD) each to storm-hit families in Ky Anh town and Ky Anh district of Ha Tinh province. The same day, the working group and the Thanh Nien (Youth) Newspaper handed over 100 gift sets worth 500,000 VND (22 USD) each to families in Bo Trach district and Ba Don town of Quang Binh province. The delegation also handed over supplies such as life jackets, floats and raincoats to volunteer youngsters in the localities. Doksuri, the 10th storm in the East Sea so far this year, swept through central Vietnam on September 15, killing nine people and causing hundreds of injuries. Since September 15, the Red Cross Society has sent missions to Ha Tinh and Quang Binh and mobilised forces to support people in storm-hit areas. 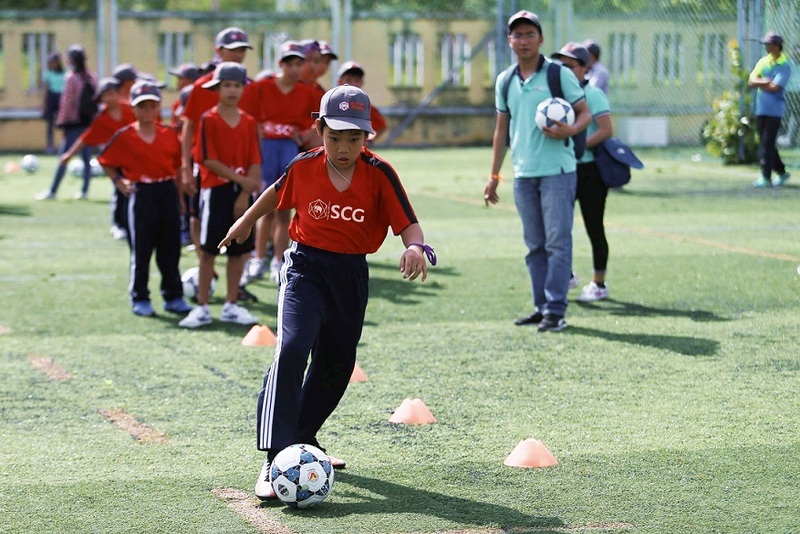 Following its continuous effort to bring better living for Vietnamese people, today SCG has collaborated with Hanoi FC to organize “Kick & Share by SCG” program to provide football skills for children in Ba RiaVung Tau province – the location of SCG’s strategic project Long Son Petrochemical Complex. This event was endorsed by Ba RiaVung Tau Department of Sports and Culture and Ba RiaVung Tau’s Youth Union to gather 160 students from grade 4th to grade 8th including disable children joining the one-day football clinic with Hanoi FC’s leading stars with national players like Quang Hai, and other members Loris Arnaud, Álvaro Silva. “As a partner of SCG, Hanoi FC is proud to be together with visional strategy of inspiring the youth to fulfill their dreams. Besides, Hanoi FC also creates more opportunities for youngsters outside Hanoi to become footballers for the professional football teams in the future if you’re potential and hard-working for the training." said Mr. Nguyen Quoc Hoi – Chairman of Hanoi FC. SCG believes that sports bring a healthy physical and especially support children to grow up with healthy lifestyle. For this program, ‘The Kick and Share by SCG’ is the football training program for children to develop foundation of football skills and inspire to play football as a health hobby. It is the part of CSR activity that in line with SCG’s vision to bring better living to Vietnamese people. In year 2016, SCG collaborated with SCG Muangthong United – the leading club in Thailand to bring “Kick & Share by SCG” to kids in Ho Chi Minh. This year, with collaboration with Hanoi FC, SCG has brought this program to Ba Ria Vung Tau as a commitment to build foundation for a better living at the locality. Some 177 grants were handed out to poor students in the Highlands provinces who overcome difficulties to well study on September 16 of Tuoi Tre (Youth) newspaper’s “Tiep suc den truong” (Giving Strength to Students) scholarship. Of 177 scholarships totally worth over VND1.2 billion ($52,830), 10 special scholarships each worth VND10 million and 167 scholarships each VND7 million. Forty good students hail from Lam Dong Province, 38 from Dak Lak Province, 33 from Dak Nong Province, 35 from Gia Lai Province and 31 from Kon Tum Province. In 2017, the program worked with communist unions in cities and provinces across the country to give scholarships to over 1,700 freshmen who come from low-income families. The scholarship giving program costs VND13 billion to grant students in Central, Highlands, South-East, Mekong delta, Northern and Northwest. Nearly 5,000 members of the Ho Chi Minh Communist Youth Union (HCYU) in central Ha Tinh province on September 17 joined hands to help local residents address consequences of typhoon Doksuri. Nearly 2,000 of them helped repair schools, healthcare stations, clear traffic jams and clean beaches in Nghi Xuan, Loc Ha, Cam Xuyen and Ky Anh districts. Local voluntary youths from Huong Son, Huong Khe, Vu Quang, Thach Ha districts and Ha Tinh city and thousands of others helped clean roads, repair electricity networks and damaged roofs, plant trees. Besides, local young people also presented 110 packages of necessary supplies and cash worth 20 million in total to residents in Ky Phu commune of Ky Anh district and Ky Ha commune of Ky Anh town. On September 16, nearly 1,850 young volunteers were mobilised to help clean the environment, overcome storm consequences, and prepare measures against post-storm rains. Nguyen The Hoan, Secretary of the HCYU of Ha Tinh province said the voluntary work will continue in the coming days to help local people stabilise lotheir lives. School facilities and scholarships were presented to poor students in the northern province of Bac Giang and Central Highlands provinces on September 16. In Bac Giang province, KFHI Vietnam, a non-profit organisation based in the Republic of Korea and Wooribank Vietnam handed over upgraded facilities to Hoa Hong kindergarten and Nam Hong primary school in Tho Xuong ward of Bac Giang city. The two schools were upgraded at a total cost of 2 billion VND (88,000 USD), aiming to raise the schools’ quality of learning environment. Meanwhile, a ceremony to present scholarships to 177 outstanding new students was held in the Central Highlands province of Lam Dong. The event, titled “Tiep suc den truong” (Give strength to students) was held by Tuoi Tre Newspaper and the provincial Youth Union in the Central Highland. The scholarships, worth 1.2 billion VND (52,830 USD) in total, ranging from 7-10 million each, were raised from a golf tournament. They were handed over to 40 students in Lam Dong, 38 in Dak Lak, 33 in Dak Nong, 35 in Gia Lai and 31 in Kon Tum, who passed the recent university and college entrance exams. Launched 15 years ago, the scholarships have provided support for disadvantaged students. In 2017, scholarships worth over 13 billion VND were presented to more than 1,700 new students nationwide. A wide range of activities have been carried outacross the country to help the victims in central provinces to overcome the consequences of storm Doksuri. On September 17, a delegation from the Ho Chi Minh Communist Youth Union Central Committee visited and handed over 25 gifts worth VND50 million to affected households in Ky Anh district, in the central province of Ha Tinh. The same day, the delegation also presented 100 gifts worth VND500,000 to victims in Bo Trach district and Ba Don town in Quang Binh province. On September 17, almost 5,000 members of the Ho Chi Minh Communist Youth Union in central Ha Tinh province joined hands to help local residents address the consequences of typhoon Doksuri. Nearly 2,000 of them helped to repair schools, healthcare stations, clear traffic jams and clean beaches in Nghi Xuan, Loc Ha, Cam Xuyen and Ky Anh districts. Local voluntary youths from Huong Son, Huong Khe, Vu Quang, Thach Ha districts, as well as Ha Tinh city and thousands of others, helped to clean roads, repair electricity networks and damaged roofs, and plant trees. Furthermore, local young people also presented 110 packages of necessary supplies and cash, worth VND20 million in total, to residents in Ky Phu commune of Ky Anh district and Ky Ha commune in Ky Anh town. Hundreds of workers and youth volunteers in Thanh Hoa and Quang Tri provinces were mobilised to help clean the environment, overcome the consequences of the stormand prepare measures against post-storm rains. According to Electricity of Vietnam, electricity supply to over 1.3 million customers was cut off due to the storm. 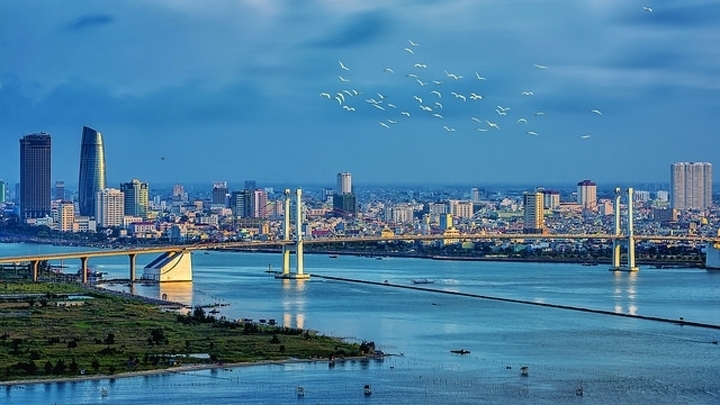 As of 3pm on September 16, the group had reconnected the power supply for nearly 780,000 customers in seriously-affected areas, such as Dong Hoi city in Quang Binh, as well as several towns and districts of Nghe An, Ha Tinh and Thanh Hoa provinces. A delegation from the Vietnam Bank for Social Policies also visited and presented 300 gifts worth VND1 million each to storm-affected households in Quang Trach and Ba Don town in Quang Binh. Doksuri, the 10th storm arising in the East Sea this year and the strongest to hit Vietnam in many years, claimed nine lives, left four missing and 112 injured, according to reports from affected localities as of 10pm on September 16. The storm swept through the central region on late September 15. According to the Central Steering Committee for Natural Disaster Prevention and Control, the typhoon destroyed 1,185 houses, unroofed 152,599 houses, whilst submerging 10,923 others. Seven fishing vessels and 183 small boats were sunk, while 29 sea dykes along the coasts of the northern and central regions, as well as 10 small irrigational dams,were damaged. Storm Doksuri also inundated 4,473ha of rice and 8,277ha of other crops, affected 16,108ha of aquatic farming, and ruined 10km of national highways and 17.9km of local roads. The Central Steering Committee for Natural Disaster Prevention and Control has mobilised all forces in order to find the missing victims, restore the electricity system, and repair transport; irrigational facilities and dykes, and help locals repair their houses and clean up the environment. It also requested that the local Steering Committees for Natural Disaster Prevention and Control keep a close watch on flood developments in the northern and northern central regions. Lao Prime Minister Thongloun Sisoulith on September 17 sent a message to his Vietnamese counterpart Nguyen Xuan Phuc, expressing his sympathy over the loss of human lives and property damage caused by storm Doksuri. The Lao government leader said he believes that under the leadership of the Vietnamese Party and Government, residents’ lives in the storm-hit areas would soon be stabilised. Doksuri, the 10th storm arising in the East Sea so far this year, swept through central Vietnam on September 15, killing nine and causing hundreds of injuries. The typhoon, said to be the strongest in a decade, brought heavy rains to central provinces from Thanh Hoa to Quang Ngai with rainfall of 100-200mm and even 300mm in some areas, along with gusts of up to 80-100km per hour. The typhoon cut off power in many localities and affected 1.3 million people. Thousands of houses were destroyed and power and telecommunications networks were damaged. Thirty three Vietnam Airlines and Vietjet Air flights from Hanoi to Ho Chi Minh City, Vinh, Dong Hoi and Thanh Hoa were cancelled. Vietnam Railways also cancelled seven passenger trains and five cargo trains at stations in Ha Tinh and Quang Binh provinces. The Vietnam-Armenia Friendship Association (VAFA) hosted a ceremony in Hanoi on September 17 to mark the 25th anniversary of Vietnam-Armenia diplomatic ties (July 14), Armenia’s 26th National Day (September 21) and Vietnam’s 72nd National Day (September 2). Addressing the ceremony, VAFA President Nguyen Van Thuan highlighted the support the Government and people of Armenia provided for Vietnam during the past struggle for national independence and territorial integrity. Armenia also helped train thousands of Vietnamese students and apprentices, who have now become competent scientists and managers, he said, adding that the precious assistance has contributed significantly to forming an important foundation for the friendship between the two nations. Established in 2014, VAFA has taken great efforts to maintain and develop people-to-people exchanges in the context of the growing Vietnam-Armenia relations, Thuan said. The organisation has also worked closely with the Embassy of Armenia in Vietnam to promote cooperation among agencies and organisations of the two countries to update information on socio-economic development and promote the images and culture of each nation. Thuan pledged that VAFA will continue promoting the traditional friendship, thus bringing the people and the culture of the two nations closer. For her part, Armenian Ambassador to Vietnam Raisa Vardanyan emphasised the strong development in the multifaceted cooperation between Vietnam and Armenia in recent years. She also called on VAFA members to actively participate in joint business cooperation projects and make contributions to bilateral cooperation in culture, social affairs, economy and trade. The Embassy of Armenia is willing to support VAFA’s activities to strengthen the traditional friendship between the two countries, the ambassador promised. The embassies of the Association of Southeast Asian Nations (ASEAN) member countries in the US and Spain co-hosted celebrations for the grouping’s 50th founding anniversary on September 16. At the event in the US, participants reviewed ASEAN’s 50 years of development, relations between ASEAN and the US and ASEAN’s role in current international issues. ASEAN has witnessed breakthrough development steps over the past five decades, becoming an organisation with the central role in the region, they noted. The delegates also lauded the ASEAN-US Strategic Partnership on the occasion of the 40th founding anniversary of bilateral relations in 2017. Over the past 40 years, ASEAN has become an important strategic partner of the US in various fields, including politics, economy, security, science-technology, humanitarian aid and regional and international issues. The US side affirmed that Washington attaches importance to and supports ASEAN’s centrality in the region as well as its efforts to build the ASEAN Community and promoting ASEAN-US relations in the time to come. The same day, the ASEAN Family Day was held in Spain by the embassies of Vietnam, Indonesia, Malaysia, Thailand and the Philippines. Speaking at the event, Ambassador Zainal Abidin Bakar of Malaysia, which is currently Chair of the ASEAN Committee in Madrid, highlighted the grouping’s great achievements during the last five decades, especially the founding of the ASEAN Community in 2015. He also emphasised the significance of the ASEAN Family Day this year as it marks the organisation’s 50th founding anniversary and 40 years of ASEAN-European Union relations, offering an opportunity for their people to enhance friendship and understanding. The event was attended by Vietnamese Minister of Culture, Sports and Tourism Nguyen Ngoc Thien, Vietnamese Ambassador to Japan Nguyen Quoc Cuong, Governor of Kanagawa prefecture Kuroiwa Yuji, and a large number of local residents, overseas Vietnamese in Japan and international tourists. Addressing the opening ceremony, Kuroiwa Yuji highlighted the scale of the 2017 festival, expressing his hope that the annual event will contribute to deepening relations between Vietnam and the Japanese prefecture. Minister Thien spoke highly of the traditional friendship between Vietnam and Japan, affirming that Japan is a long-term and important partner of Vietnam. Therefore, the relationship between Vietnam and Kanagawa prefecture will continue developing strongly in all fields in the future, Thien said. According to the minister, Vietnam welcomed over 700,000 Japanese tourists in 2016, while more than 200,000 Vietnamese holiday-makers visited Japan. He expressed his hope that the two nations will continue sharing values of the traditional cultures to bring their people closer to each other. The festival featured over 100 stalls showcasing cultural products, food, handicrafts and specialties of Vietnamese localities. An exhibition space affirming Vietnam’s sovereignty over Hoang Sa (Paracel) and Truong Sa (Spratly) archipelagos was also organised during the festival. The event attracted around 500,000 visitors and contribute to the enhancement of the Vietnam-Japan friendship while expanding economic and tourist exchanges. The Vietnamese Embassy in the United States has organised a ceremony to celebrate the 72nd anniversary of Vietnam’s National Day (September 2). Speaking at the event, Vietnamese Ambassador to the US Pham Quang Vinh described the National Day as an important milestone in Vietnam’s history, marking a turning point for Vietnam to become a dynamically developing nation and an active member of the international community. He highlighted the strong development in Vietnam-US relations since the establishment of diplomatic ties, particularly after the two countries set up a comprehensive partnership, which are being consolidated under US President Donald Trump’s administration. Vietnam and the US have issued a joint statement for enhancing the bilateral relationship to a new height during Vietnamese Prime Minister Nguyen Xuan Phuc’s visit to the US in May, Vinh said, adding that US President Trump is scheduled to pay a visit to Vietnam in November. The Vietnamese diplomat pledged to work closely with US agencies to prepare for the US President’s visit to Vietnam and attending the APEC Economic Leaders’ Meeting in November, thus building on the positive momentum of bilateral relations and strengthening cooperation between the US and the Asia – Pacific region. For her part, Acting Assistant US Secretary of State Susan Thornton underlined the all-out cooperation between the two countries, particularly in economy, trade, education, tourism, elaborating that the Vietnam - US trade value reached nearly 60 billion USD in 2016, and there are more than 21,000 Vietnamese students studying in the US. The figures reflect the strong development in the US-Vietnam relationship, she said, promising to continue promoting the US-Vietnam Comprehensive Partnership in the coming time, as well as cooperating with Vietnam and the Association of Southeast Asian Nations (ASEAN) in regional and international issues of common concern, including security, safety and freedom of navigation, counter-terrorism, non-proliferation of nuclear weapons. Diane Farrell, Deputy Assistant Secretary for Asia at the US Department of Commerce’s International Trade Administration underscored the remarkable growth in relations between the two countries, particularly in economy, trade, and investment. A similar ceremony was held by the Embassy of Vietnam in Indonesia in Jakarta on September 15. Vietnamese Ambassador to Indonesia Hoang Anh Tuan highlighted the achievements Vietnam has made over the past 72 years of national construction and 30 years of Doi Moi (Reform) and international integration. Vietnam has achieved a high annual average economic growth rate in recent years and become a bustling market in the world’s fastest growing region, he stressed. Participants enjoyed Vietnamese traditional art performances and dishes during the events. Ho Chi Minh City has issued a list of regulations on teaching English in primary schools as many schools in the city are offering English courses taught by native speakers. As requested by the city’s administration, native English teachers have to talk with their students instead of using audiovisual equipment such as cassette, CD player or interactive whiteboard so as to give students more opportunities to practice English. For the same purpose, Vietnamese teaching assistants also have to speak with students in English. Meanwhile, English nicknames are not allowed as the regulation specifically says native teachers have to call students by their Vietnamese names. Schools that hire native teachers for English courses have to use private investments to pay for their salaries and seek agreements with parents before offering those courses to students. In addition, these schools have to treat native teachers like their official employees by letting them join school activities and meetings. English is an obligatory subject from secondary school across Vietnam, but in large cities, many primary schools demand high competency. With job vacancies available all year round offering high salaries, Vietnam was ranked the second best place in the world to teach English earlier this year by TEFL Exchange, a community for teachers of English as a foreign language. The site estimates that a foreign English teacher can earn between $1,200-2,200 a month in Vietnam, where the average annual income in 2016 was just $2,200. They can find a job any time of year and the best places to do so are the country’s three largest cities: Hanoi, HCMC and Da Nang. Candidates only need to hold a bachelor’s degree and a TEFL (Teaching English as a Foreign Language) certificate.